A hectic penultimate session on Tuesday saw a flurry of exits and Chance Kornuth take control of this year's PCA Main Event. After starting the day with 24 players, Day 5 of the $10,000 MTT saw a host of seasoned pros, including Jim Collopy, Felipe Ramos and the UK's Ben Pollak, just miss out on a final table appearance. 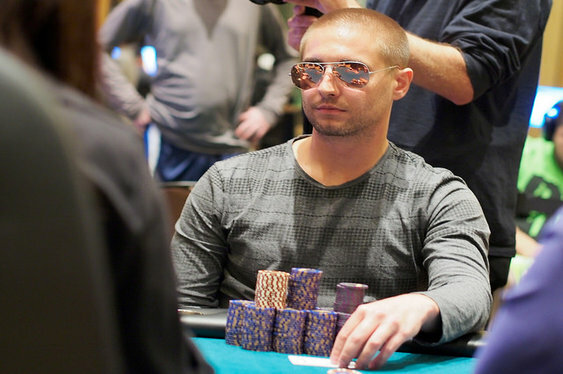 Kornuth's run towards the top of the chip counts began midway through the session. Despite a couple of early setback, the American pro managed to rally himself after he scored a timely double up with pocket aces. That hand set the tone for the rest of the day and within a few levels his aggressive pre-flop strategy had earned him the scalps of players such as the aforementioned Ramos. However, before things could spiral out of control, Kevin Schulz was able to narrow the gap slightly ahead of today's finale. Although still more than 1 million chips behind Kornuth, Schulz's elimination of Pratyush Buddiga gave him the final piece of momentum at the close of play. After watching his opponent move all-in with Ac Jh from under the gun, Schulz made the easy call with pocket aces and watched as a somewhat testing Jc 8c 6c 7d 8d board ran out. Having secured Buddiga's stack, Schulz and his fellow five finalists were left to bag and tag their chips in preparation for today's session. Joining the two chipped up American in the final push for the $1.5 million top prize are: Niklas Hambitzer, Diego Ventura, Rami Boukai and Juan Martin Pastor. Play will resume at 13:00 local time and continue until the new PCA Main Event champion is crowned.